White vests, from Zara; cotton linen saris, both from Anavila. On Ranjana: silver bangles, her own. The laws of Internet Browsing Behaviour dictate that each human spends a preordained amount of time scouring social media for topics that specifically interest them. This may be beauty for a few, fashion for others, while some users veer towards fitness-related content. My Instagram kryptonite happens to be dance. When I was younger, I would consume So You Think You Can Dance and Dancing with the Stars with the same zest that my grandmother reserved for the K-serials. Later, in the confines of my room, I would try to mimic the techniques I had watched, and convince myself that my execution was excellent. I’d think that I was pirouetting gracefully, but in reality I was barely managing to not pass out from the twirling. I am jolted out of this childhood reverie as my cab comes to a screeching halt outside The Space, a boutique studio in Juhu which regularly holds fitness and lifestyle classes. Aarifa Bhinderwala and Ranjana Dave, who have volunteered to submit to our experiment in locomotion, are engaged in conversation as they warm up together. 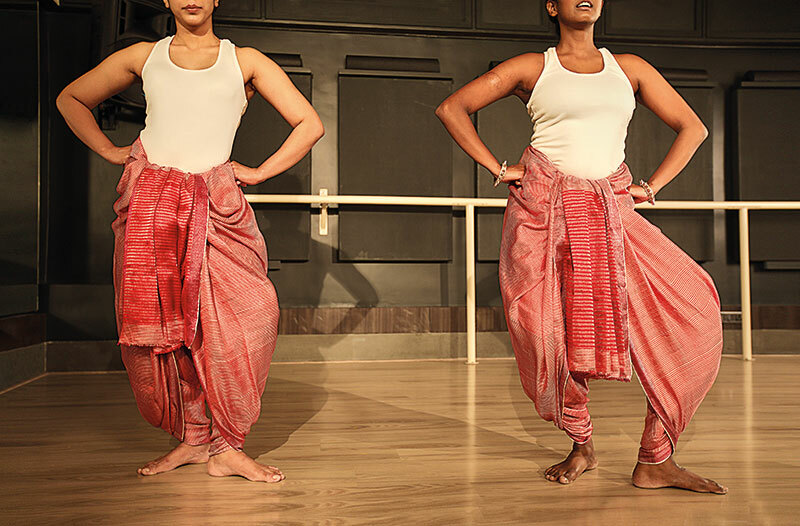 The former, a maverick pole dancer, and the latter, a trained Odissi practitioner, have agreed to swap roles for a day to ascertain how effectively the body of a dancer can adapt to an unfamiliar form. I may appear calm on the outside, but I can feel the dance-loving childhood version of me stirring with excitement at the prospect of an eventful day. Before she walked into her first class two years ago, 29-year-old Bhinderwala hadn’t even watched a video on pole dancing, let alone attempted any moves. Her only brush with dance had been the stray classes she’d signed up for, in which she had tried out different styles. But it wasn’t until after her first pole class that she found her true calling. She reminisces, “My initial experience wasn’t too successful, because I had applied copious amounts of moisturiser on my body and kept slipping off. I saw the other girls conducting their spins with effortless ease, and the universe whispered into my ear that I would get there very soon.” I realise that Bhinderwala’s intuition wasn’t far off the mark, as I watch her demonstrate a complicated inversion with the grace of a gazelle. Dave is impressed by her peer’s display of skills, and can’t wait to try her hand — quite literally — at the pole. The 30-year-old Odissi dancer discovered the ancient classical form at the age of 15, and fell in love with how her body looked when she performed. She had learned Bharatanatyam as a child, but her fascination for it ebbed as soon as she stumbled upon Odissi; she was enamoured by its structural nuances, like the complex torso movements and undulating motions. But mostly, it was the music that made her fall in love with Odissi. She claims to have a soul connection with the sound of the mardala, a percussion instrument, and the melody of the ukutas, rhythmic syllables sung in various combinations, both of which accompany performances. Twin poles are ready at the centre of the studio, and Bhinderwala reflexively takes hold of one. She spins around hypnotically, concluding the display with an inversion that render everyone in the studio speechless, right from the spot boy to the hair and make-up artist. The sleek, metal apparatus isn’t friend or foe to Bhinderwala. It’s a lover; one that she grabs seductively in a very public sort of foreplay. The pole, in turn, is an accommodating partner, but comes with dangers, as I can see from the bandages on her feet. Invigorated by a pep talk from her teacher, Dave tries her first spin — which requires locking one foot over the calf of the other leg — and immediately plummets to the ground. A little taken aback by the miscalculation, she stands up resolutely and gives it another go, once again not meeting with much success. I give her an understanding smile, empathising with her apparent inability to connect with the pole. Dave is having none of it; the next 20 minutes consist of constant slips and falls. At one point, Bhinderwala even tries to balance Dave’s body weight with her own hands just so that she can manage to cling to the pole for a longer time. The Odissi dancer’s resilience, in spite of the mounting number of failed attempts, is impressive. Perhaps it was this same quality that prompted the organisers of this year’s Serendipity Arts Festival to have her on a panel where she could lend her curatorial expertise to a programme that includes classical dance performances and new ventures by emerging and established choreographers. Dave, who has struggled with the notion of ‘perfection’ in the past, admits to having taken a harsh and negative view of her body and its abilities. “You never feel good enough, and instead of focusing on the dance, you are constantly evaluating yourself and being excessively self-critical.” I have a feeling that her body holds her in high regard for eventually steering clear of any unrealistic expectations and, by virtue of this respect, bends to her will. Soon I see Dave is spinning slowly down the pole, not with the same effortlessness as Bhinderwala, but with the promise of a gifted beginner. Her instructor claps gleefully and rushes to join her on the adjacent pole and that’s when we get our shot of the day — two women who love dance coming together in perfect unison. But the duo’s magnum opus comes in the next few minutes — Bhinderwala executes a stunning inversion, which has her hanging upside down with Dave simultaneously performing a split on the same pole. As we wrap up the shoot, I spot our tireless dancers exchanging numbers and notes, and am hit by a delightful vision — Bhinderwala in a silk sari adding a twist to some elaborate Odissi moves, and Dave twirling sinuously around a pole. I quickly snap back to my senses before my musings expand to include myself in the daydream, the burn marks on my calves serving as warning. Or maybe, come morning, they will be my motivation to sign up for an intensive pole dancing class.